It was the day of the 2008 Historic Churches Bike Ride. We had planned to wend our way along the border between Norfolk and Suffolk, but we soon got fed up with the number of churches in the northern county which were not taking part, and so decided to devote the rest of the day to the friendly, welcoming churches of northern Suffolk instead (and I know in which county I'll be leaving my legacy if I ever win the lottery, folks). St Nicholas is a big church, and I had a vivid memory of arriving here on my bike during a storm some ten years before. Today was quite different, with the early September sunshine warming up the air and filling it with a golden light. 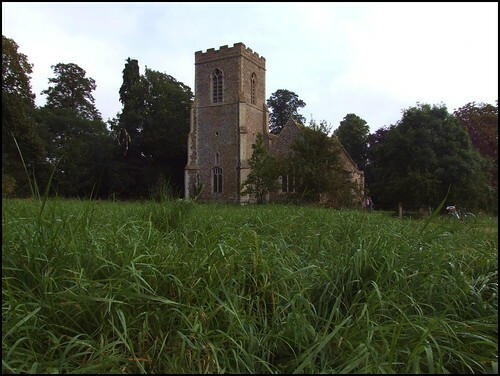 The church is set back from the road behind a hedgerow, with an open fallow field beside it. When Pevsner came this way in the 1960s he found it much overgrown with ivy, and how handsome that is, and how rarely one sees it in these archaeological times! He even noted that the creepers hung down over the east window, but today I am pleased to say that the church has been rescued from the encroachment of nature. Ivy is no good for buildings, and no doubt it was hard-headed thoughts about the cost of maintenance which led to its removal rather than anything archaeological. Unusually for East Anglia, this is a pretty much complete work of the 14th Century - another good example is neighbouring Rickinghall Inferior, a church which has much in common with this one, despite two very different towers. The bulk of the south aisle of the nave gives the impression of two churches sitting side by side. Sam Mortlock points out that, interestingly, at the time this aisle was built, the Rector here was Edmund Gonville, founder of Gonville and Caius College in Cambridge. You step into what is an overwhelmingly Victorian interior, but with a pleasing rural feel to it. Such a big church could easily have succumbed to a soulless, urbanising restoration, but the architect was Richard Phipson, always a safe pair of hands, if not exciting ones. The finest feature, and the one which captures the eye, is the magnificent east window, its five lights and bubbly Decorated tracery full of mainly clear glass which floods the chancel. Mortlock thought that the remains of medieval glass in the upper lights was original, and he is probably right. Contemporary with it is the piscina in the south aisle, which has been battered over the years, but still has a surviving green man in the bottom of the eastern pillar. St Nicholas was obviously a shining star in the Anglo-catholic firmanent in the early years of the 20th Century, and a few devotional fixtures survive from that time. The large roundel of the Flight into Egypt, which is believed to be 18th Century Italian, was given by the Rector in the 1940s, and there is a statue of the young Christ preaching in the temple in an elaborate image niche at the west end. Those days probably also brought the selction of mid-19th Century Saints in glass which are set in the east window, presumably originally from another church. Dominating the south wall of the chancel is the huge mural monument to Henry Bokenham and his wife. Bokenham died in 1648, and he sits with his wife at the top, with their books and a skull. Their sin and daughter sit below. Pevsner thought that the quality of the monument is poor, but in fact it injects something of a note of sophistication into what is otherwise a pleasantly rustic place. Another hint of sophistication, perhaps, is that John Middleton Murray is buried in the graveyard. The fiercest literary critic of the middle years of the 20th Century and the husband of Katherine Mansfield, he was a friend of DH Lawrence and the editor of the Atheneum magazine. A vociferous promoter of High Culture in the face of increasing relativism, he is almost forgotten today.